Since 1983 Kiefer Sutherland has acted in dozens of movies, starring most recently beside Michael Douglas in “The Sentinel.” He’s played a musketeer, murderer, vampire and cowboy. On Sunday afternoon, Sutherland arrived to promote his new music label. He’s traveling with the band Rocco DeLuca to try and boost sales of their CD. Though the band played a few songs, the crowd was undeniably there for a chance to speak with the “24” star. Fan after fan clutched DVD copies of the show. Some wore CTU agent shirts. The crowd passed the time waiting for his arrival by trading theories about how next season will start. The audience last saw Jack Bauer in dire circumstances, trapped on a boat headed for a Chinese prison. “He’s going to single handedly take down the entire Chinese government,” said fan Nick Kane. As to how Bauer would accomplish this, Kane said all he needs to do is be himself. “He is Jack Bauer, he can do it,” he said. According to Kane’s friend Kevin Groupe, the next season will be an attempt to rescue Bauer from captivity. Whatever it is, there’s no doubt they will watch religiously. 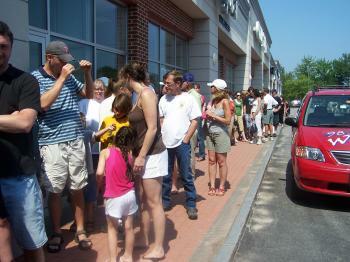 Fans clogged the sidewalk outside Bull Moose Music on Sunday. They were there to meet Keifer Sutherland, star of the hit TV show “24.” Sutherland was in town to promote his new music label.